1864 to 1902 - ACHILLES - Armoured Frigate - 9280 tons - 115.8 x 17.8 - 1864 HM Dockyard, Chatham - 22x7in, 4x8in. 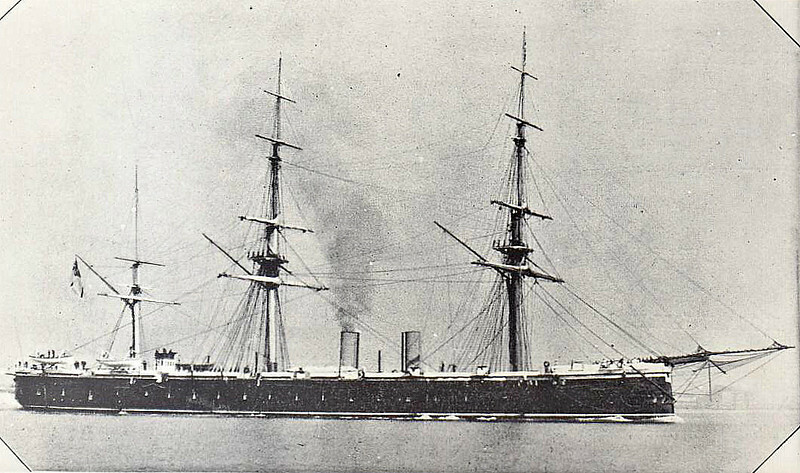 - 14 knots - 1864 Channel Fleet, 1868 Guardship, Portland, 1875 Guardship, Liverpool, 1878 Particular Service Sqdn, 1880 Channel Fleet, 1885 decommissioned, 1902 Depot Ship. Malta. HIBERNIA, 03/04 EGMONT, 1914 Depot Ship, Chatham, 1916 EGREMONT, 1919 PEMBROKE, 01/23 sold for breaking.